Andrea, born Dec. 6, 1969; Jayson, born Dec., 1970; Stephanie, born Nov.1, 1973; step-son Eric, born More…Dec. 17, 1970; Jonathan, born April 30, 1974. All our children are married and all but one are local. Jonathan and his wife and their two children, Jacob and Rebekah live in Round Rock, TX. Our children have given us 5 wonderful grandchildren, ages 13, -6. We are blessed that our offspring get along well with everyone else and co-operate as in the death of my father, Joseph Linder, on June 20, 2014. I went for one year to Indiana Univ., but found it too easy, so with the bribe of my own new convertible, I transferred back to UC when it was still a street car school. I graduated with a B.A. in Psychology in 1962, after which Robert Beck got married (too young). We had 3 children in nine years and with more children, our marriage plunged into abuse. I left Robert in 1975, taking my children and dogs and we were "no-faulted -- a joke. I worked at jobs which would let me be home when my children came home from school. I was an entrepreuer as a founder of low-calorie desserts in Roselawn. I got national and then international publicity before I really knew what I was doing, businesslike. The business fluctuated as more people found Sweet & Slender Inc, which was 20 years ahead of its time. A mutual businesslike introduced me to Jay Avner in 1982, after six months of hilarious, with at least 3 children around. I worked as a Marketing Executive, then as free lance ( which is now called free lance) Until I was in a serious car crash when I was rear-ended at high speed while we were living. The accident broke my back in 2 places. After that, I remained freelance and retired with chronic pain when I was 59. Now I am a member of the sandwich generation, being Gran for our grandchildren and two mothers, and my Mother at 93. About 5 years ago, I became a painter, In oils and acrylics, specializing in flowers. I show my work at The Pendleton Art Center on Final Fridays. 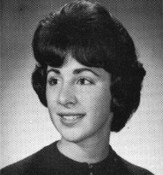 Judy Linder Avner has a birthday today. Wishing you a very very happy birthday. Judy Linder Avner has a birthday today. New comment added.